Upgraded one bedroom oasis looking right over the ocean. 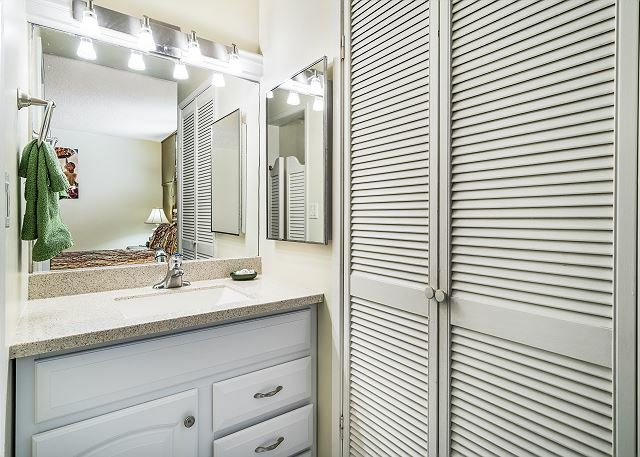 You will love the unit, you will love the location, walking distance to everywhere in town. 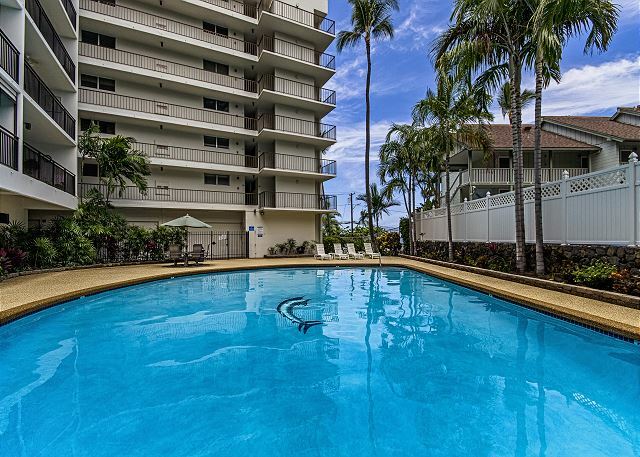 Thank you for posting this 5 star review of Kona Ali'i 304! 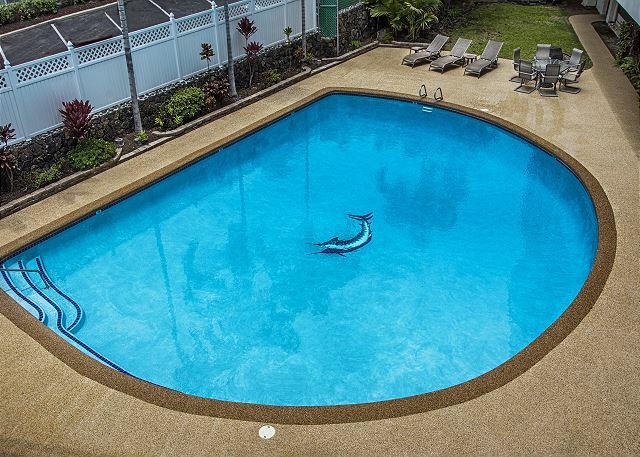 We are happy to hear you had a beautiful stay at this excellent location in Kona. We hope to see you again soon. Remember to contact our attentive property manager, Nick, for our repeat visitor rates! 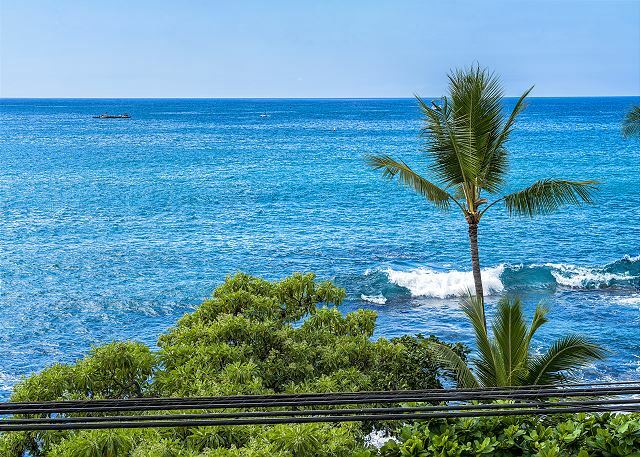 Kona Alii, for us, is the perfect location as you can walk everywhere. We love watching the spinner dolphins most days right in front of you. We have also seen whales. Listening to the waves at night lulls you to sleep. This unit is arranged differently than any others and takes a bit to get used to. The biggest downside with unit 304 is the kitchen. Because of the placement of the refrigerator you loose counter space and makes, what there is, difficult for 2 people to work or be in the kitchen at the same time. It would be helpful to move the refrigerator bk on side wall and add a bit more counter space. We especially like working with Nick at Boundless. If you have any questions or problems with the unit they are right there to answer questions or fix any issues you may have. Mahalo, for your review of Kona Ali'i 304. We will pass along your kitchen remodel suggestions to the owner. 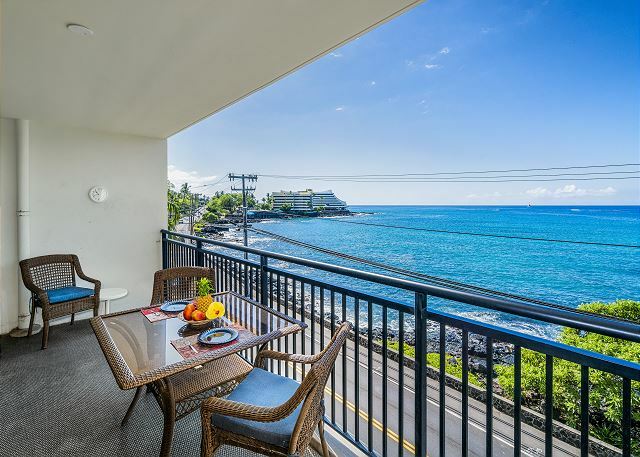 We very much hope you return, and please do contact our attentive property manager, Boundless Hawaii, for our coveted repeat visitor rates which are the best you can access. Thank you for mentioning this. We hadn't seen it as an issue and we have now scheduled for it to be reversed. The condo was clean and well equipped and the Boundless team were very easy to deal with and very kind. The location was fun, especially watching the evening crowds walking in and out of town. We arrived and the place was beautiful and ready to go. Only bummer is no a/c for those that are used to having an a/c unit. The place did have plenty of fans which was nice. Would definitely stay again. Aloha and mahalo for your review. We are so happy that you enjoyed your visit at Kona Ali'i 304! 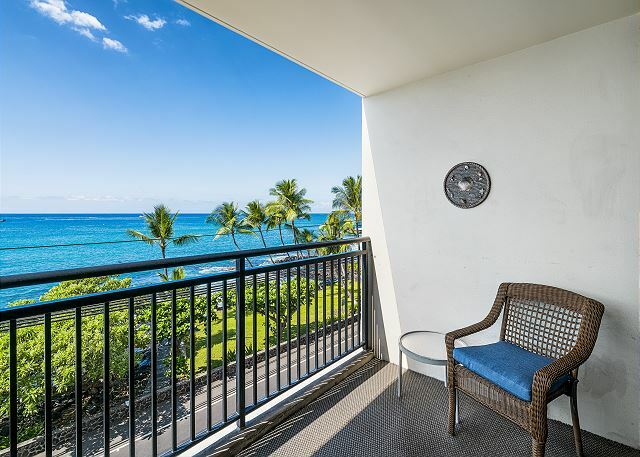 Although this unit does not have air conditioning, we feel that there is something special about the Hawaiian breeze that flows from the ocean to through the lanai doors to cool the condo. Overall, we had a great month in Kona. Our condo was quite comfortable, with a good view, even if partially blocked by the palm trees. Not much to complain about. The street noise from Alii Drive is loud. 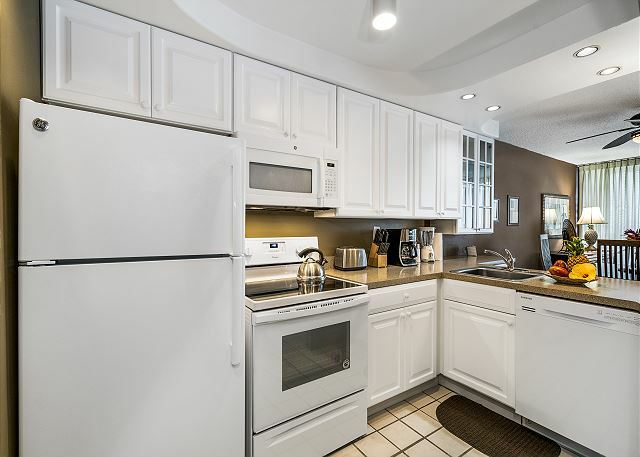 This condo has no cooking supplies. Not even salt & pepper. We did buy those and leave them there. The front bathroom is very nice. 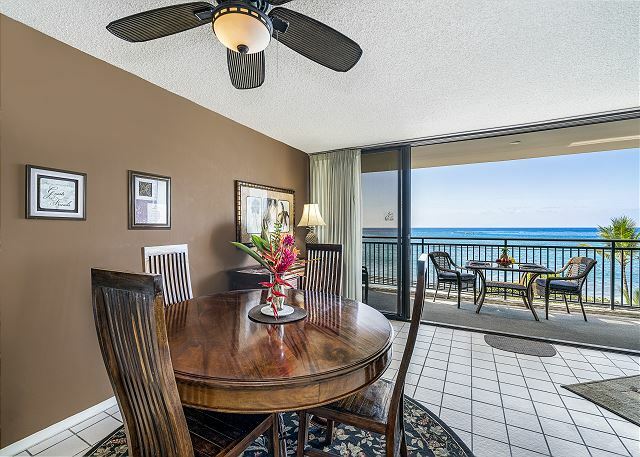 One of the largest we've seen in the Kona Alii condos. We enjoyed the closeness of restaurants around the area. Love Lava Java. Also Humpys, Bongo Bens, Huggos and Bubba Gumps are near by and good. Aloha, Thank you for another visit with us and taking the time to leave feedback! We look forward to hosting you again next year for your annual visit. Remember, we don't supply herbs, spices, oil etc, but we do offer grocery packages. Great location. Wish there was a lighting on the deck. Dryer had no heat. Aloha, Thank you for staying with us. Outdoor lighting is a great recommendation. As for the dryer, it has been tested fully functional with heat after your departure. We hope you return and let us know if you encounter future issues. Remember, returning guests will receive a 10% discount for any unit. This unit was very nice, there are a few things in the kitchen that need to be replaced but all in all it was very comfortable. Terrific view from lanai. Close to all village activities, restaurants etc. building is very secure. At times heavy smokers were in suite one floor below resulting very strong cigar and cigarette smoke rising up to our suite. Location excellent Condo excellent Only thing missing was air conditioning. Next year will need a place that is air conditioned. We were there for the HIBT fishing tournament. We enjoyed our stay in this suite. Everything in town is walking distance or short drive as you prefer. View is spectacular, seeing whales out the window every day and watching people and the world go by. The finishes, accessories, and appliances were basic but good, bed nice, some items showing signs of needing repair but not unexpected for a suite being rented full time. Only thing lacking we noticed was a bucket/mop or such for cleaning floor as its all tile (vacuum provided). You are able to BBQ in the pool area, but BBQ is basic and in need of maintenance which is condo building manager responsibility, not your host/property manager, so plan accordingly for cooking just in case its out of propane or needs repair for a couple days. Very safe area to our eyes and experience but some homeless and drug use in area so be aware as with any other place in a town. Great experience overall, and Boundless looked after us very well. Not knowing for certain what to expect, we were pleasantly surprised when we walked into the unit. Everything was clean and up to date and the location was perfect for us! The parking was a little confusing the first night in the dark but turned out to be very convenient and we enjoyed the security measures to the whole building. The view was very welcoming and we loved the sound of the ocean all night. It was warm in the unit without an A/C but I welcomed it a bit more than my other half. I would most definitely recommend this unit to others and would happily rent again! We will come to this unit 304 because we are where all the action is and we enjoy the beautiful view . The people are very friendly . It is a very good place to rent. This little condo was a great place to spend a week. A great view of the ocean, boats coming and going, dolphins and people watching from the patio. 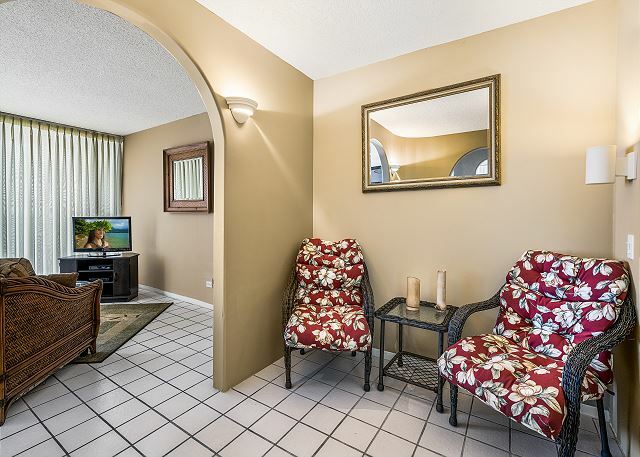 The condo was clean and well equipped and comfortable for two. We loved the location which is right in the middle of things in this town. It was easy to get out and walk to coffee, dinner or happy hour. The pool area is very nice and theres a BBQ. Note that it is great to have your own parking space and also the security situation is very good. I would recommend staying here. Everything was fantastic location, condo etc… One terrible thing out of managements control. Next door neighbours chain smoked on the balcony with their door closed. All their smoke blew into ours it was as if we were smoking. I could smell it all the way to the back room. A first for having our Children and Grandchildren on a trip together and Kona was the perfect place. Most everything we needed was within walking distance. The room was great. 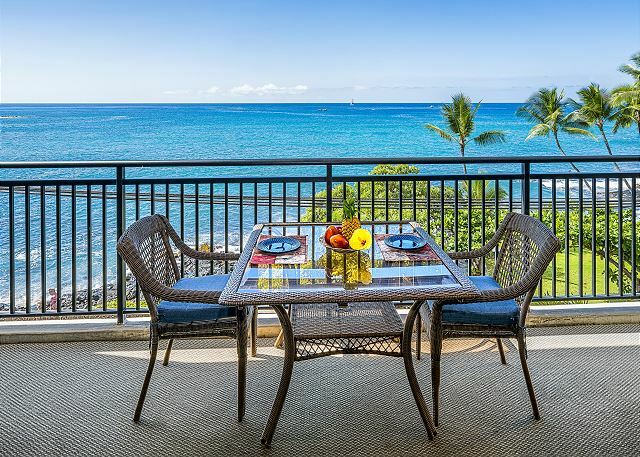 Perfect view of the ocean and being able to see fish in the water from our Lanai and hearing the sounds of the waves breaking at night was great. Only exception, my Grand Daughter did not like the swinging doors on the bathroom (teen thing). No problems with reservation process at all. They were more than helpful. Wonderful family stay. sunset views. Spent alot of time on the lani. It was great. 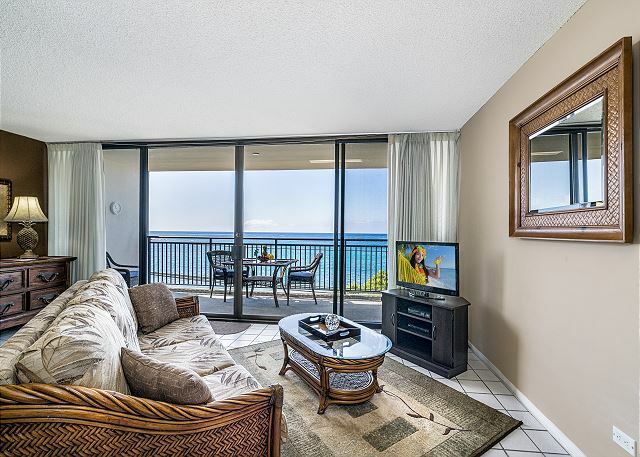 We love Kona Alii view and location and unit 304 met all our needs. Prince Properties is a very professional management agency we have used several times. The only hitch was the starter package of coffee was unground beans and we couldn't find the grinder. We survived that one. The property needed some maintenance, but inspite of that it was a wonderful place to stay. So convenient to all downtown activities and shops. However, I would suggest at least a starter kit for coffee for that first morning, salt and pepper, and dishwasher soap would be handy. It is very difficult to find grocery staples in small amounts at the local grocery stores. We had to leave a lot of supplies behind, we only hoped that the next guest was able to use the coffee filters, dish soap, paper towels, baggies, the extra beach chair and the salt and pepper. I enjoyed my stay over the new years eve had fun watching all the fire works from my lanai. The Kona Alii was great, really close to our favorite place to eat on the Earth. Shimono. Also very centrally located. This property was in one of the best locations I've ever stayed in - although the waves during high surf get quite loud! The living area/kitchen were nice, but the back room and bathroom could use some work. Also, some of the kitchen items could be replaced (coffee maker rusted, toaster too small for regular bread, rusty forks). Also, the lack of any real doors could be a privacy issue for people other than families staying here. For the price, this rental was a good value. 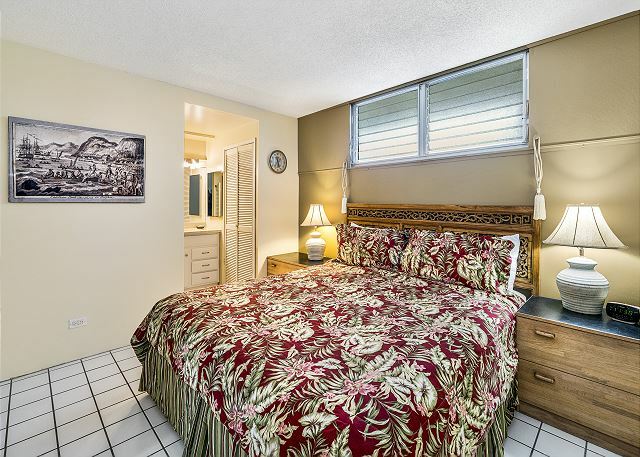 Perfect Location for Ironman - within walking distance to the pier, registation, and expo. Eliminates the hassel of trying to drive athletes to the swim start Saturday morning. Unfortunately, although the unit we rented is a non-smoking unit, other units are not managed by Prince Properties, Inc. and have no jurisdiction over residents smoking in adjacent units. Everything was great except for all the construction noise that started very early and ended around 5 or 6. Once everything is finished it should be a great place to stay and we will probably be back and stay longer.